The efficient materials handling of metals should be possible whether the load is hot or cold, steel slabs or wire coil. How are heavy duty trucks with the right attachments driving the production process? Downtime, bottlenecks and inefficiencies curse most industries, but when your place of work is better known as the ‘Gates of Hell’ these kinds of problems can border on the ruinous. 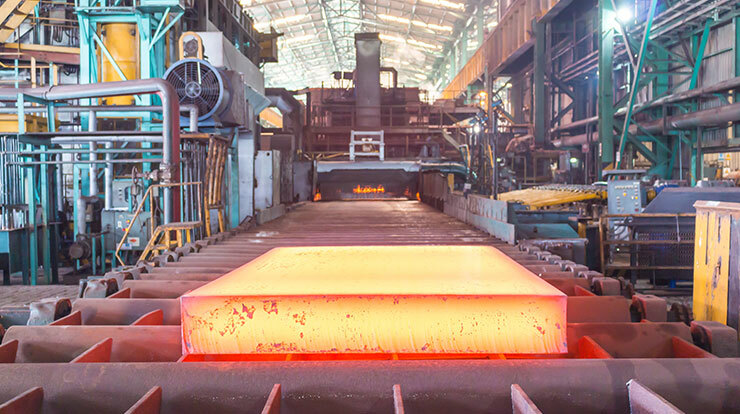 In the metals industry, where specialist equipment is needed for materials handling at temperatures of 1,500°C or more, managers and workers face a unique and demanding set of challenges. If one part of their operation doesn’t work effectively, the whole process can fall apart. That’s potentially disastrous in a marketplace where steel and other metal products are considered expensive by international standards. With Chinese output driving down prices, anything that businesses can do to protect margins is vital. Achieving these efficiencies and limiting downtime means choosing purpose-built equipment designed to match the specific operating requirements associated with the materials handling of metals. Modern heavy duty trucks that can lift up to 52 tonnes are all very well, but when it comes to materials handling raw strength is only one part of the requirement. Nowadays, trucks need to do so much more. When used well, they determine the rhythm of a production facility by ensuring that every stage in the manufacturing process leads seamlessly on to the next. These aren’t jobs for just any machine. Heat from the metal product or from radiation will seriously affect the vehicle, so trucks need special adaptations such as heat-resistant hoses and front fenders to stop tyres softening. At Hundhausen’s factory in Schwerte in Germany, where high quality ductile cast iron elements are made for automotive industry, Hyster Company has supplied reliable and robust equipment to withstand the extreme heat for 30 years. The trucks are bombarded with shards of iron at temperatures of 1,500°C for six days a week, around the clock. As well as protecting workers at the ‘Gates of Hell’, Hundhausen’s productivity has been optimised thanks to the reliability of the trucks and the fleet of 30 Fortens trucks that carry out more routine work. The materials handling of metals comes in many shapes, sizes and weights, whether it’s steel band coils, wire coils, pipes, tubes, structural steel or hot semi-finished products. So it makes sense for companies to invest in fewer machines to do more varied work. For example, the same ReachStacker can handle containers, trailers and steel coils. The use of a tool changer allows easy exchange of attachments, from the standard spreader used to move containers to an intermodal spreader for help with transportation or a C-hook attachment for movement of the steel coils. It’s maximum flexibility with minimum fuss. Whether you need to lift 13 tonnes, 40 tonnes or multiple steel coils at the same time, a range of attachments will turn a standard-production forklift truck into a powerful, purpose-built solution. For example, using the right ram attachment will make it possible to carry more products in one go or to enable both hot and cold steel handling. Efficiency is boosted as products will only need to be handled once, rather than by more than one vehicle through a series of movements. Having the right attachment will also make the handling of some tricky loads much easier. The rolling nature of pipes and tubing make them notoriously difficult to deal with, which is why the use of clamps is important for versatile, safe bulk-handling. Such efficiency is demonstrated by port and logistics company Zuidnatie at its facility in Antwerp, Belgium, where steel and non-ferrous metals are received, stored, repacked and distributed through the road or rail networks. With so many different workflow stages to manage, the port has a fleet of Hyster® trucks with the versatility and built-in flexibility for various fork-handling duties. In addition, load sensing hydraulics mean the vehicles only deliver maximum power when really needed, helping the company adhere to emissions legislation and significantly reduce its fuel bills. The cab design provides operatives with all-round visibility for the stacking of containers up to eight high. In such a challenging environment, these are the kinds of benefits that can quickly accumulate, turning the efficient materials handling of metals into a major competitive advantage. This applies across the metals industry, whether it’s the chill winds of port-side logistics or at the Gates of Hell. Purpose-built equipment tailored to the operating conditions will boost efficiency. Heavy-duty trucks, when used well, can determine the rhythm of a production facility. It’s possible to invest in fewer machines to do more varied work. A range of attachments turns a standard fork-lift truck into a powerful, purpose-built solution. A ram attachment can carry more products in one go or enable both hot and cold steel handling.